From some observations, chicks can be seen in the nest in October/November. The Red-breasted Coua builds a bowl-shaped nest with woven twigs, placed in epiphytic fern or palm, about 2-4 metres above the ground. The female lays two white eggs. No further information. The Red-breasted Coua can be fairly common locally. It has restricted range but it occurs in several protected areas. The population appears to be stable, as long as suitable forest habitat still exists in Madagascar. The Red-breasted Coua is not globally threatened and currently evaluated as Least Concern. 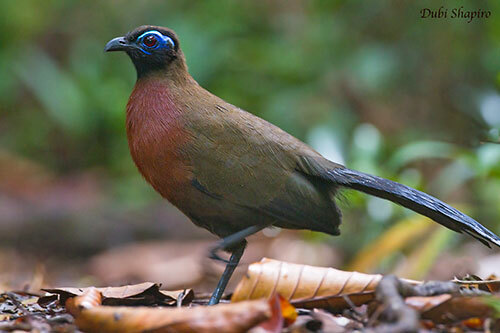 The Red-breasted Coua is endemic to Madagascar, but it is only present in E and NE of the island where it frequents the undisturbed rainforest. It is a large, stocky, long-tailed, terrestrial bird, very secretive and shy. It is usually found alone or in pairs, feeding on the ground by walking while searching for insects and small fallen fruits beneath the trees. 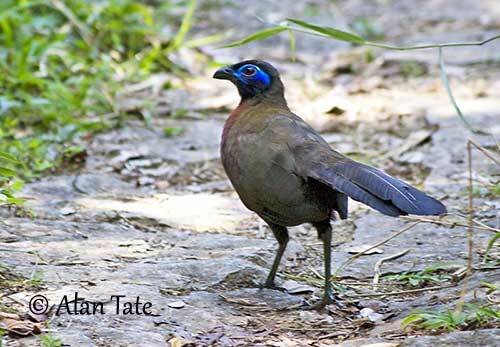 The Red-breasted Coua has very restricted range, but it occurs in several protected areas. The species is not currently threatened. The Red-breasted Coua has bronze to green-brown upperparts, but head and nape are darker. There is a coppery wash on mantle and upper back. Flight feathers and long tail are blue-black. On the underparts, chin and throat are black. The breast is dark rufous and gives the bird its name. Rest of underparts is mostly blackish-brown. On the dark head, we can see a conspicuous area of blue, bare skin around the eye. The bill is black. The eyes are deep brown or red, surrounded by blue eyering. Legs and feet are dark grey. The juvenile has bronze upperparts with pale buff spotting. On the upperwings, coverts and flight feathers have buff edges. The tail is dull black. On the underparts, throat and belly are olive. The breast is dull chestnut. The bare skin around the eye is dull blue. The bill is pale with dark tip. The Red-breasted Coua occurs mainly in E and NE Madagascar, from N Onive R to Andapa Basin, E to Masaola Peninsula and W through Tsaratanana massif to Sambirano and Daraina regions. The Red-breasted Coua frequents mainly the undisturbed evergreen humid forest, and can be seen from sea-level up to 1,250 metres of elevation. The Red-breasted Coua is noisy during the breeding season. The common call is a high-pitched, descending whistle, often repeated and ending in a soft growl “cheeoow-ugh”. It also gives a high-pitched, melodious “tee-oooo”. The alarm call is a harsh, resonant “eeowll” note. Individuals usually respond to each other’s calls. The Red-breasted Coua feeds on insects and small fruits usually taken on the ground while walking and running both on ground and horizontal branches. It often feeds beneath other fruit-eater birds and takes the fallen fruits. When threatened, it runs with horizontal body into the vegetal cover. Like other couas, it is frequently observed sunbathing in sunny spots on the forest floor. The feathers are ruffed, the wings are dropped and the tail is widely fanned. The breeding behaviour of the Red-breasted Coua is poorly known. However, we can suggest that the bright blue bare skin around the eye and the long tail feathers are enhanced by adapted postures during the courtship displays. The Red-breasted Coua is resident on the island. It rarely flies, and usually prefers to run to reach the vegetal cover when alarmed.